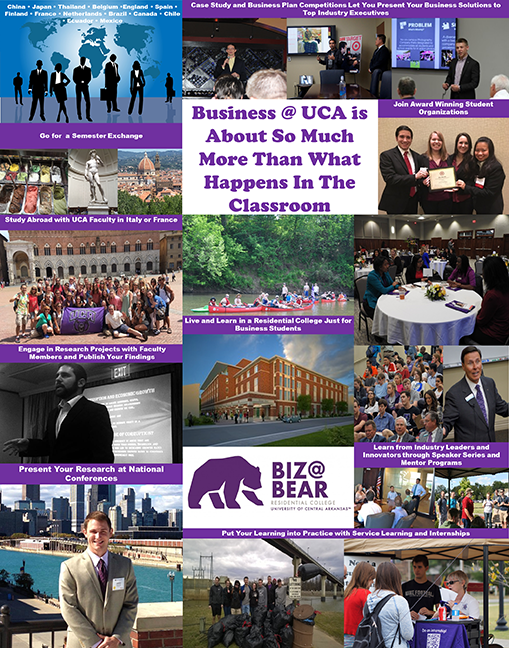 In the College of Business at UCA, we strive to bridge the gap between education and practice. We offer students numerous opportunities to network with industry professionals through student organizations, classroom guest speakers, and College level speaker events such as the Davis Family Lecture Series. Integrated Business Experiences allow students to put their knowledge into practice through case studies, class projects where the students are consultants for various businesses or non-profits, simulations, service learning, and various competitions sponsored by industry groups or national associations. Every major in the college also allows and encourages students to pursue internships for academic credit to gain further relevant career experiences prior to graduation. Many students also have the opportunity to engage in research projects on a one-on-one basis with a faculty mentor if they so desire. Students may also choose to participate in a faculty-led study abroad experience or a full semester study abroad exchange with one of our numerous partner schools around the world. Students in selected majors may also have the opportunity to earn industry standard certifications while completing their course requirements. All of these opportunities are designed to further prepare students to take that next step in life after graduation whether it is entering their desired profession or pursuing additional education.